On 1st November Decorfolia celebrated it's first year with Pat at the helm. How could we mark the occasion? - what better than a trip to Holland to visit our main hydroculture plant supplier? So off we went! The little group included Peter, Anita, and Mark all of whom you know, and our latest recruit Laura. Following a busy morning working on the nursery and making a delivery to Blandford, we set off for Dover in high "spirits", it was Halloween after all. A night in a French motel saw us en route early Thursday morning for a very pretty little town just outside Eindhoven. We were greeted with fresh coffee, then shown around the nursery by Jos, one of the main sales reps there. This huge glass house complex is run as a double sided operation. They supply good quality hydroculture plants to all corners of Europe, but they are also one of four main growers and breeders of Bromeliads and Anthuriums - we have included a little article on the spectacular and colourful Anthuriums in another addition of newsletter. 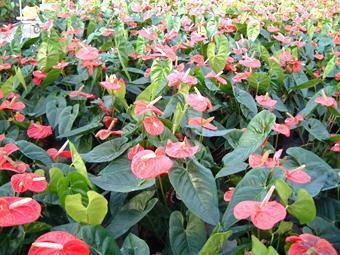 Whilst at the nursery we listed a number of interesting plants that we hope to add to our ever growing range of plants. Of course if you could find room for a few additional displays we could ensure that some of these new ideas find their way into your office! Watch out for pictures of these in future 'news letters', but here is one to be going on with. 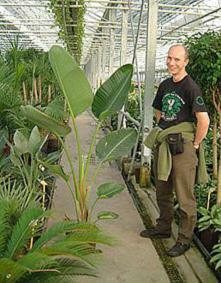 Strelitzia we have used in soil planting before, but not in hydroculture. We were a very tired group arriving at our hotel near Amsterdam on Thursday evening, but there was one more surprise in store - a lovely cake to celebrate Pat's first anniversary as boss and Decorfolia's twenty fifth year. What a fantastic day it had been. On Friday we had a little free time so Peter arranged to meet some of his family, the rest of us hit Amsterdam with a full list of places to visit. - We managed to fit in the Anne Frank House, Singel Floating Flower Market (of course), Van Gough Museum and even a canal boat trip! It was truly a worthwhile journey, we learnt so much from our Dutch colleagues and we hope that you, our valued customer will in the long-term benefit from this exercise. How can we celebrate year 2?….well- lots of the plants that are used as "stock" for cuttings originate from large houseplant nurseries in Costa Rica! (possibly a little too far for a weekend trip! ).